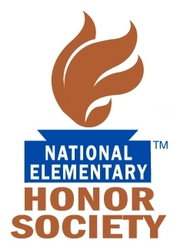 The National Elementary Honor Society (NEHS) recognizes fourth and fifth grade students for their outstanding academic achievement and demonstrated personal responsibility. Through NEHS, students provide meaningful service to the school and community and develop essential leadership skills. NEHS supports these purposes by strengthening the lives of our nation’s elementary students and the schools in which they are enrolled. O.C. Taylor is proud to establish the first chapter of the National Elementary Honor Society here in GCISD. Establishing a chapter encourages student achievement, promotes leadership opportunities, engages meaningful community service projects, and brings a tradition of excellence to our school. The 2018-2019 Formal Induction Ceremony will be held on Thursday, April 25, 2019 at 6:00 PM.